Long before I took up writing and coaching, I used to be a knight in shining armor. More precisely, I was an actor that spent a good portion of my career on horseback before starring in a couple of soap operas and independent films. While it was quite nice to eventually see the name Michael Neeley in film, stage, and television credits, there was still something missing. I felt unfulfilled – not about what I was getting, but about what I was giving. So, while I never became an “A” List actor, my profession was still very fun and rewarding, spanning more than twenty years before I finally decided to shift my purpose. My son, Tristan, was born in 2002 and I decided to leave the L.A. smog and raise him in clean air and clear skies. My life was taking on a different meaning, and I began searching for what I was meant to do, who I was meant to be, and why I was here on this little blue dot. It was by happy circumstance that my acting training intertwined with my current endeavors, and even became an informing factor in much of the work that I currently do. 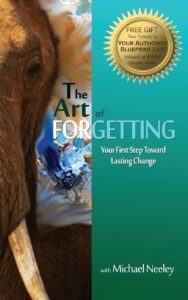 If you’ve read some of my material, you may already see the correlation to our day-to-day lives; or if you’re not yet familiar with my work, The Art of Forgetting may shed some light on why you are the way you are and how you show up in the world. Either way, I welcome you to explore with me as far as you want to go.